Windows 7 Theme Elemental Snow is an awesome theme that will change the look of your Windows PC to a completely different elegant look. 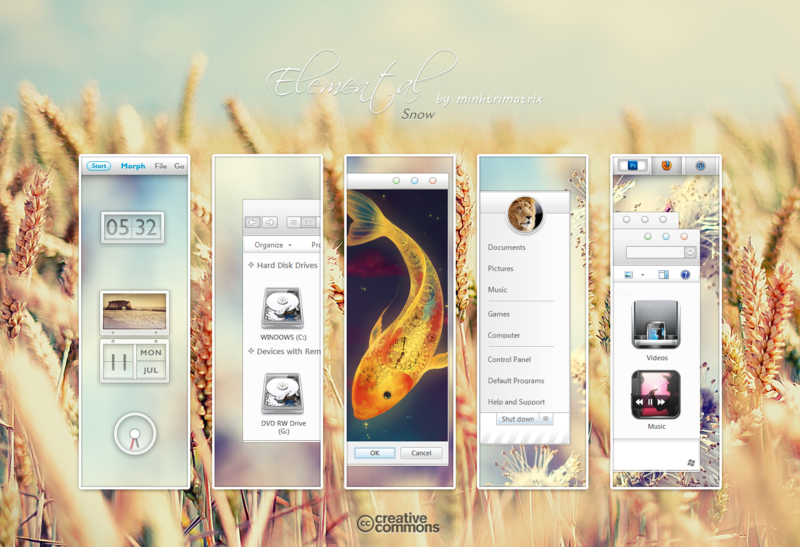 Windows 7 Theme Elemental Snow is suitable for both of the two versions of Windows – 32 bit and 64 bit. Windows 7 Theme Elemental Snow is created by djeos546. We published other great works by the developer before. License : Some rights reserved. It is licensed under a Creative Commons Attribution-Noncommercial-No Derivative Works 3.0 License. This Visual Style is for Windows 7. Windows 7 Theme Elemental Snow works on both 32 and 64-bit.This is an Aero replacing VS. To use it, Install Universal Theme Patcher, re-patch again if you updated to SP1, Copy everything in themes folder (Elemental (Snow)folder, E – Snow (Bottom), E – Snow (Top)) into C:WindowsResourcesThemes, Restart Windows & then select this theme in Personalize Menu. Click here for the bigger preview (will open in new window). It is a ZIP download,, the file is 8.3 MB in size. This Article Has Been Shared 7655 Times! Windows 8 Theme V2 for Windows 7 is Purely Windows 8 looking Visual Style for Windows 7. The theme is suitable for both of the two versions of Windows – 32 bit and 64 bit. Windows 7 Theme Aero Plus Glow as described by the developer is 72% Aero and 28% of it is Metro visual style. His concept is aero outside, metro inside. Windows 7 Theme CrÃ¨me is for crÃ¨me de la crÃ¨me minimalistic audience who loves the magic of translucency on their desktop and Windows. Cite this article as: Abhishek Ghosh, "Windows 7 Theme Elemental Snow Updated Version," in The Customize Windows, June 5, 2012, April 19, 2019, https://thecustomizewindows.com/2012/06/windows-7-theme-elemental-snow-updated-version/.